Lingk recipes help to eliminate time wasted on messy flat file processes, modernize integrations and optimize technical resources for accelerating integration agility in education and corporate learning. "By using Lingk recipes we reduce development and support time. Integrations could be done by staff on the Salesforce team, thereby improving operational efficiency because the learning curve for the wizard and recipes is significantly shorter than for a stick-built program. For our first rollout, we developed 28 PeopleSoft integrations and did 5 bulk conversions of historical data using Lingk recipes. That’s an incredible amount of integration done by a tiny staff. The 360-degree project is considered a success and few people realize what a risk the volume of integration needs were." "Lingk recipes connected the dots that allow us to provide a streamlined user experience and to capture the complete user cycle for analysis and marketing purposes. This saves staff time and increases our ability to serve learners and partners. Implementation was efficient, and communication was clear. Lingk has been a terrific partner for leveraging data in new ways." Traditionally, getting the SIS and LMS connected was a large accomplishment by itself. Today, there are more demands for improved learner experiences and diverse education business models requiring solid integrations between three key systems - the SIS, LMS, and CRM. When these three systems are connected (with a data warehouse or a data lake), institutions and organizations are prepared to meet the challenges of the future. Lingk recipes improve data-driven decision making and help to deliver the best experiences for students, employees, faculty and staff - at an affordable cost. Simply view, customize, and run a recipe solution below. The public recipe library provides a wide variety of example starting points for your solution. If you don't see an example solution you are looking for in our public recipe library or are looking for help to build your private recipe library, we can provide support and services resources to meet your needs. Contact us today to learn more. 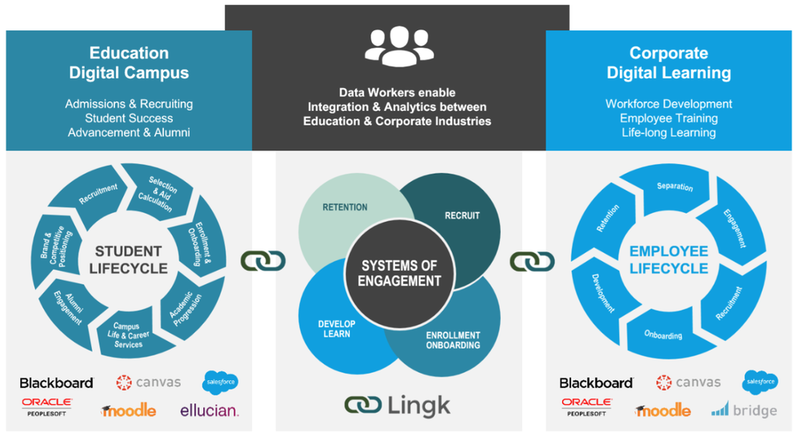 Lingk believes in the power of enterprise and educational standards to make integration and data processing easier. The Lingk platform is able to process standards like Caliper and xAPI. Diverse data can be transformed into standard models like OneRoster and Common Education Data Standards (CEDS) using Lingk recipe solutions. Recipe solution templates built for these standards can be shared and reused across enterprises and institutions, lowering the bar for integration everywhere.